It’s been a few weeks now, but the inspiration and buzz is still lingering. 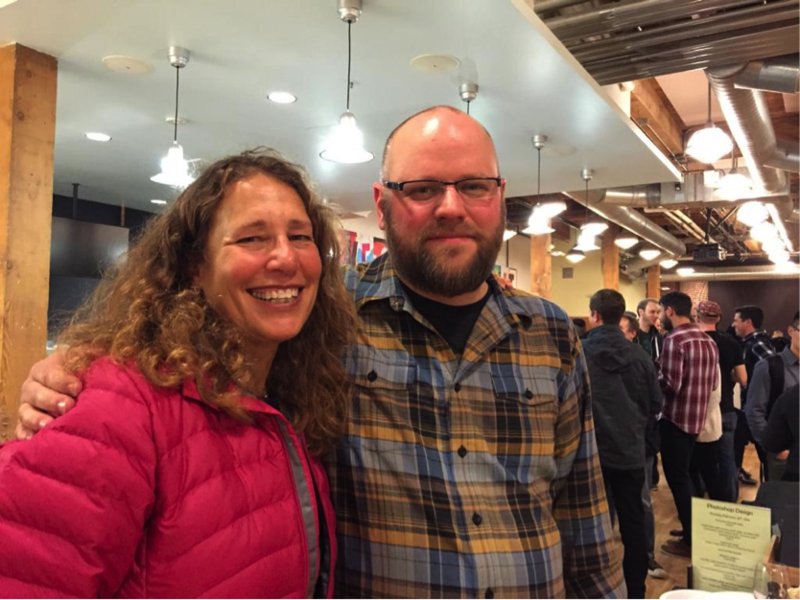 A highlight of my career was introducing Susan Kare at a Dribbble + Photoshop meetup at Adobe’s headquarters in San Francisco. Last year, Rich, Charles Pearson and some of the Photoshop team had a brainstorm meeting about doing another event together. I thew out something that, at the time, seemed like a pipe dream and/or a long shot. “Hey, let’s ask Susan Kare to give a short talk.” I had just watched a video of a presentation she gave and it was incredibly compelling. Miracuously, she said yes, even creating custom icons for the event. She went on to speak for 45 minutes about her journey as an artist and her pioneering work as the original icon and typeface designer for the original Macintosh. Her early work solidified many concepts that we all still see today: The watch, paint bucket, trash can, save etc. as well as font and interface systems that inspired everything else that followed them. But the biggest takeway from meeting Susan and hearing her speak about her work, is that she’s one of the most kind and humble people I’ve ever met. Which considering the impact of her work, is rather astounding. Remember, long after the pixels are gone, that’s what people will remember about you. So treat each other with respect, and curiosity, and kindness, as you never know who and when you’ll cross paths with.